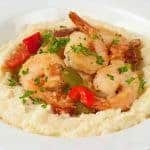 A popular dish originating in the Lowcountry of Georgia and South Carolina, shrimp and grits has a distinctive blend of flavors and textures that lend it an almost addictive quality. 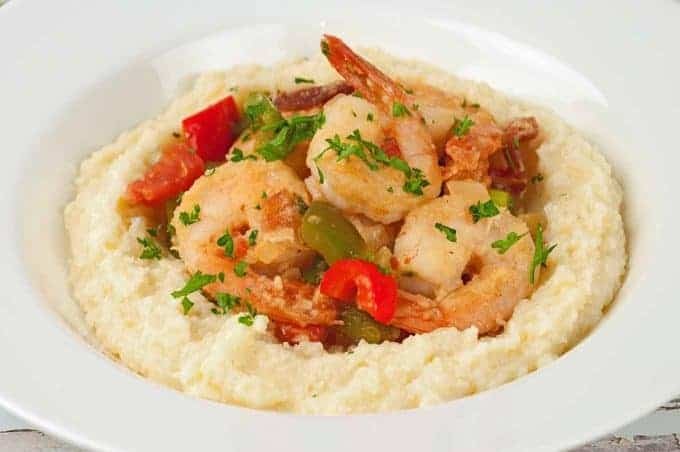 The grits are creamy and smooth with a subtle cheddar cheese flavor that pairs beautifully with the smoky shrimp, bacon and bell pepper combo served on top. Serve with a salad and our Oven-Roasted Okra to round out a great meal with a classic Southern flair. Fry the bacon until crisp, transfer to a paper towel-lined plate and set aside. Reserve the bacon fat in a small bowl. 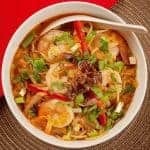 Combine the 1/2 cup of the chicken broth, Tabasco, Worcestershire sauce and lemon juice in a small bowl and set aside. Next, prepare the grits. Bring the remaining 3 cups of chicken broth to a boil in a medium saucepan. 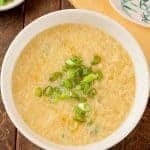 Add the grits, reduce the heat to medium-low and cook, stirring continually, until the liquid is absorbed and the grits are tender, 4 to 5 minutes. Add the butter and cheese and stir until the cheese is melted and the mixture is smooth. Cover and set aside to keep warm. 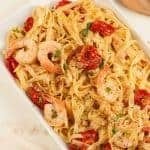 Combine the flour with 1/2 teaspoon salt and a few grinds of black pepper. Dredge the shrimp in the flour mixture and shake off the excess. Heat 1-1/2 tablespoons of the reserved bacon fat over medium-high heat and add the shrimp in a single layer (work in batches if necessary). Sauté until the shrimp are firm and just starting to turn pink, about 1 minute per side. Transfer to plate and set aside. 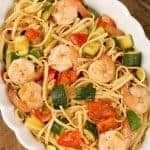 Note: The shrimp do not need to be cooked through at this time. Add another tablespoon of the bacon fat to the pan and reduct the heat to medium. 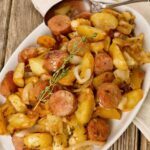 Add the onion and celery and sauté until the onion is soft and translucent, 4 to 5 minutes. Add the garlic, green pepper and red pepper. 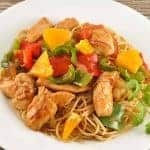 Continue cooking, stirring frequently, until the peppers are tender, 5 to 6 minutes longer. Season to taste with salt and pepper. Add the chicken broth mixture to the vegetables and bring to a simmer. 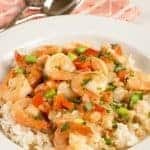 Return the shrimp to the pan, stir to coat the shrimp with the broth and cook until the liquid has thickened and the shrimp is cooked through, 2 to 3 minutes. Remove from the heat, taste and adjust the seasoning if needed. 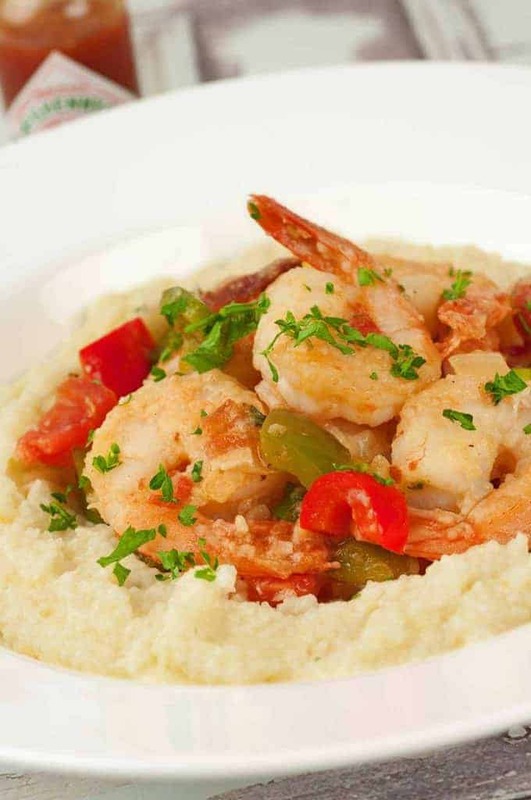 To serve, plate individual portions of grits, top with the shrimp mixture and garnish with chopped parsley.